Time is a part of the measuring system used to sequence events, to compare the durations of events and the intervals between them, and to quantify rates of change such as the motions of objects.The temporal position of events with respect to the transitory present is continually changing; future events become present, then pass further and further into the past. Time has been a major subject of religion, philosophy, and science, but defining it in a non-controversial manner applicable to all fields of study has consistently eluded the greatest scholars. A simple definition states that “time is what clocks measure”. Time is one of the seven fundamental physical quantities in the International System of Units. Time is used to define other quantities — such as velocity — so defining time in terms of such quantities would result in circularity of definition.An operational definition of time, wherein one says that observing a certain number of repetitions of one or another standard cyclical event (such as the passage of a free-swinging pendulum) constitutes one standard unit such as the second, is highly useful in the conduct of both advanced experiments and everyday affairs of life. The operational definition leaves aside the question whether there is something called time, apart from the counting activity just mentioned, that flows and that can be measured. Investigations of a single continuum called spacetime bring questions about space into questions about time, questions that have their roots in the works of early students of natural philosophy. Two contrasting viewpoints on time divide many prominent philosophers. One view is that time is part of the fundamental structure of the universe, a dimension in which events occur in sequence. Sir Isaac Newton subscribed to this realist view, and hence it is sometimes referred to as Newtonian time.Time travel, in this view, becomes a possibility as other “times” persist like frames of a film strip, spread out across the time line. The opposing view is that time does not refer to any kind of “container” that events and objects “move through”, nor to any entity that “flows”, but that it is instead part of a fundamental intellectual structure (together with space andnumber) within which humans sequence and compare events. This second view, in the tradition of Gottfried Leibniz and Immanuel Kant, holds that time is neither an event nor a thing, and thus is not itself measurable nor can it be travelled. Temporal measurement has occupied scientists and technologists, and was a prime motivation in navigation and astronomy. Periodic events and periodic motion have long served as standards for units of time. Examples include the apparent motion of the sun across the sky, the phases of the moon, the swing of a pendulum, and the beat of a heart. Currently, the international unit of time, the second, is defined in terms of radiation emitted by caesium atoms (see below). Time is also of significant social importance, having economic value (“time is money”) as well as personal value, due to an awareness of the limited time in each day and in human life spans. Ray Cummings, an early writer of science fiction, wrote in 1922, “Time… is what keeps everything from happening at once”, a sentence repeated by scientists such as C. J. Overbeck, and John Archibald Wheeler. Temporal measurement, or chronometry, takes two distinct period forms: the calendar, a mathematical abstraction for calculating extensive periods of time, and the clock, a physical mechanism that counts the ongoing passage of time. In day-to-day life, the clock is consulted for periods less than a day, the calendar, for periods longer than a day. Increasingly, personal electronic devices display both calendars and clocks simultaneously. The number (as on a clock dial or calendar) that marks the occurrence of a specified event as to hour or date is obtained by counting from a fiducial epoch — a central reference point. Artifacts from the Palaeolithic suggest that the moon was used to calculate time as early as 6,000 years ago. Lunar calendars were among the first to appear, either 12 or 13 lunar months (either 354 or 384 days). Without intercalation to add days or months to some years, seasons quickly drift in a calendar based solely on twelve lunar months. Lunisolar calendars have a thirteenth month added to some years to make up for the difference between a full year (now known to be about 365.24 days) and a year of just twelve lunar months. The numbers twelve and thirteen came to feature prominently in many cultures, at least partly due to this relationship of months to years. The reforms of Julius Caesar in 45 BC put the Roman world on a solar calendar. This Julian calendar was faulty in that its intercalation still allowed the astronomical solstices and equinoxes to advance against it by about 11 minutes per year. Pope Gregory XIII introduced a correction in 1582; the Gregorian calendar was only slowly adopted by different nations over a period of centuries, but is today by far the one in most common use around the world. An Egyptian device dating to c.1500 BC, similar in shape to a bent T-square, measured the passage of time from the shadow cast by its crossbar on a nonlinear rule. The T was oriented eastward in the mornings. At noon, the device was turned around so that it could cast its shadow in the evening direction. 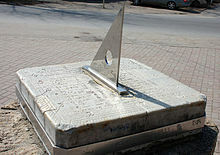 A sundial uses a gnomon to cast a shadow on a set of markings which were calibrated to the hour. The position of the shadow marked the hour in local time. The most precise timekeeping devices of the ancient world were the water clock or clepsydra, one of which was found in the tomb of Egyptian pharaohAmenhotep I (1525–1504 BC). They could be used to measure the hours even at night, but required manual upkeep to replenish the flow of water. The Greeksand Chaldeans regularly maintained timekeeping records as an essential part of their astronomical observations. Arab inventors and engineers in particular made improvements on the use of water clocks up to the Middle Ages. In the 11th century, Chinese inventors and engineers invented the first mechanical clocks to be driven by an escapementmechanism. The hourglass uses the flow of sand to measure the flow of time. They were used in navigation. Ferdinand Magellan used 18 glasses on each ship for his circumnavigation of the globe (1522). Incense sticks and candles were, and are, commonly used to measure time in temples and churches across the globe. Waterclocks, and later, mechanical clocks, were used to mark the events of the abbeys and monasteries of the Middle Ages. Richard of Wallingford(1292–1336), abbot of St. Alban’s abbey, famously built a mechanical clock as an astronomical orrery about 1330. Great advances in accurate time-keeping were made by Galileo Galilei and especially Christiaan Huygens with the invention of pendulum driven clocks. The English word clock probably comes from the Middle Dutch word “klocke” which is in turn derived from the mediaeval Latin word “clocca”, which is ultimately derived from Celtic, and is cognate with French, Latin, and German words that mean bell. The passage of the hours at sea were marked by bells, and denoted the time (see ship’s bells). The hours were marked by bells in the abbeys as well as at sea. A chronometer is a portable timekeeper that meets certain precision standards. Initially, the term was used to refer to the marine chronometer, a timepiece used to determine longitude by means of celestial navigation, a precision firstly achieved by John Harrison. More recently, the term has also been applied to the chronometer watch, a wristwatch that meets precision standards set by the Swiss agency COSC. The most accurate timekeeping devices are atomic clocks, which are accurate to seconds in many millions of years, and are used to calibrate other clocks and timekeeping instruments. 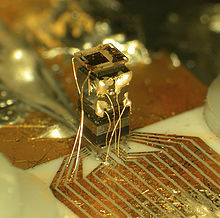 Atomic clocks use the spin property of atoms as their basis, and since 1967, the International System of Measurements bases its unit of time, the second, on the properties of caesium atoms. SI defines the second as 9,192,631,770 cycles of that radiation which corresponds to the transition between two electron spin energy levels of the ground state of the 133Cs atom. In medieval philosophical writings, the atom was a unit of time referred to as the smallest possible division of time. The earliest known occurrence in English is in Byrhtferth’s Enchiridion (a science text) of 1010–1012, where it was defined as 1/564 of a momentum (1½ minutes), and thus equal to 15/94 of a second. It was used in the computus, the process of calculating the date of Easter. As of 2006, the smallest unit of time that has been directly measured is on the attosecond (10−18 s) time scale, or around 1026 Planck times. lunar month 27.2–29.5 days Various definitions of lunar month exist. The SI base unit for time is the SI second. From the second, larger units such as the minute, hour and day are defined, though they are “non-SI” units because they do not use the decimal system, and also because of the occasional need for a leap second. They are, however, officially accepted for use with the International System. There are no fixed ratios between seconds and months or years as months and years have significant variations in length. At its 1997 meeting, the CIPM affirmed that this definition refers to a caesium atom in its ground state at a temperature of 0 K.Previous to 1967, the second was defined as:the fraction 1/31,556,925.9747 of the tropical year for 1900 January 0 at 12 hours ephemeris time. The current definition of the second, coupled with the current definition of the metre, is based on the special theory of relativity, which affirms our space-time to be a Minkowski space. 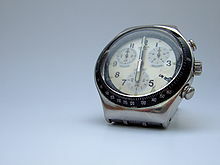 Time keeping is so critical to the functioning of modern societies that it is coordinated at an international level. The basis for scientific time is a continuous count of seconds based on atomic clocks around the world, known as theInternational Atomic Time (TAI). Other scientific time standards include Terrestrial Time and Barycentric Dynamical Time. Coordinated Universal Time (UTC) is the basis for modern civil time. Since January 1, 1972, it has been defined to follow TAI with an exact offset of an integer number of seconds, changing only when a leap second is added to keep clock time synchronized with the rotation of the Earth. In TAI and UTC systems, the duration of a second is constant, as it is defined by the unchanging transition period of the caesium atom. Greenwich Mean Time (GMT) is an older standard, adopted starting with British railroads in 1847. Using telescopes instead of atomic clocks, GMT was calibrated to the mean solar time at the Royal Observatory, Greenwich in the UK.Universal Time (UT) is the modern term for the international telescope-based system, adopted to replace “Greenwich Mean Time” in 1928 by the International Astronomical Union. Observations at the Greenwich Observatory itself ceased in 1954, though the location is still used as the basis for the coordinate system. Because the rotational period of Earth is not perfectly constant, the duration of a second would vary if calibrated to a telescope-based standard like GMT or UT—in which a second was defined as a fraction of a day or year. The terms “GMT” and “Greenwich Mean Time” are sometimes used informally to refer to UT or UTC. The Global Positioning System also broadcasts a very precise time signal worldwide, along with instructions for converting GPS time to UTC. Earth is split up into a number of time zones. Most time zones are exactly one hour apart, and by convention compute their local time as an offset from UTC or GMT. In many locations these offsets vary twice yearly due to daylight saving time transitions. The following time conversions are accurate at the millisecond level. Some are exact while others have differences at the microsecond level. Sidereal time is the measurement of time relative to a distant star (instead of solar time that is relative to the sun). It is used in astronomy to predict when a star will be overhead. Due to the rotation of the earth around the sun a sidereal day is 4 minutes (1/366th) less than a solar day. Another form of time measurement consists of studying the past. Events in the past can be ordered in a sequence (creating a chronology), and can be put into chronological groups (periodization). One of the most important systems of periodization is geologic time, which is a system of periodizing the events that shaped the Earth and its life. Chronology, periodization, and interpretation of the past are together known as the study of history. Ancient cultures such as Incan, Mayan, Hopi, and other Native American Tribes, plus the Babylonian, Ancient Greek, Hindu, Buddhist, Jainist, and others have a concept of awheel of time, that regards time as cyclical and quantic consisting of repeating ages that happen to every being of the Universe between birth and extinction. In general, the Judaeo-Christian concept, based on the Bible, is that time is linear, beginning with the act of creation by God. The general Christian view is that time will end with the end of the world. Others suggest that time is like a ray, having a beginning but going on forever into the future. A time (’êth) to give birth, and a time to die; A time to plant, and a time to uproot what is planted. The Greek language denotes two distinct principles, Chronos and Kairos. The former refers to numeric, or chronological, time. The latter, literally “the right or opportune moment,” relates specifically to metaphysical or Divine time. In theology, Kairos is qualitative, as opposed to quantitative. Two distinct viewpoints on time divide many prominent philosophers. One view is that time is part of the fundamental structure of the universe, a dimension in which events occur in sequence. Sir Isaac Newton subscribed to this realist view, and hence it is sometimes referred to as Newtonian time.An opposing view is that time does not refer to any kind of actually existing dimension that events and objects “move through”, nor to any entity that “flows”, but that it is instead an intellectual concept (together with space and number) that enables humans to sequence and compare events. This second view, in the tradition of Gottfried Leibniz and Immanuel Kant, holds that space and time “do not exist in and of themselves, but … are the product of the way we represent things”, because we can know objects only as they appear to us. The Vedas, the earliest texts on Indian philosophy and Hindu philosophy dating back to the late 2nd millennium BC, describe ancient Hindu cosmology, in which the universe goes through repeated cycles of creation, destruction and rebirth, with each cycle lasting 4320 million years. Ancient Greek philosophers, including Parmenides and Heraclitus, wrote essays on the nature of time.Plato, in the Timaeus, identified time with the period of motion of the heavenly bodies. Aristotle, in Book IV of his Physica defined time as the number of change with respect to before and after. In Book 11 of his Confessions, St. Augustine of Hippo ruminates on the nature of time, asking, “What then is time? If no one asks me, I know: if I wish to explain it to one that asketh, I know not.” He begins to define time by what it is not rather than what it is, an approach similar to that taken in other negative definitions. However, Augustine ends up calling time a “distention” of the mind (Confessions 11.26) by which we simultaneously grasp the past in memory, the present by attention, and the future by expectation. In contrast to ancient Greek philosophers who believed that the universe had an infinite past with no beginning, medieval philosophers and theologians developed the concept of the universe having a finite past with a beginning. This view is shared by Abrahamic faiths as they believe time started by creation, therefore the only thing being infinite is God and everything else, including time, is finite. Isaac Newton believed in absolute space and absolute time; Leibniz believed that time and space are relational. The differences between Leibniz’s and Newton’s interpretations came to a head in the famous Leibniz-Clarke Correspondence. Time is not an empirical concept. For neither co-existence nor succession would be perceived by us, if the representation of time did not exist as a foundation a priori. Without this presupposition we could not represent to ourselves that things exist together at one and the same time, or at different times, that is, contemporaneously, or in succession. Immanuel Kant, Critique of Pure Reason (1781), trans. Vasilis Politis (London: Dent., 1991), p.54. Immanuel Kant, in the Critique of Pure Reason, described time as an a priori intuition that allows us (together with the other a priori intuition, space) to comprehend sense experience. With Kant, neither space nor time are conceived as substances, but rather both are elements of a systematic mental framework that necessarily structures the experiences of any rational agent, or observing subject. Kant thought of time as a fundamental part of an abstract conceptual framework, together withspace and number, within which we sequence events, quantify their duration, and compare the motions of objects. In this view, time does not refer to any kind of entity that “flows,” that objects “move through,” or that is a “container” for events. Spatial measurements are used to quantify the extent of and distances between objects, and temporal measurements are used to quantify the durations of and between events. (See Ontology). Henri Bergson believed that time was neither a real homogeneous medium nor a mental construct, but possesses what he referred to as Duration. Duration, in Bergson’s view, was creativity and memory as an essential component of reality. According to Martin Heidegger we do not exist inside time, “we are time“. Hence, the relationship to the past is a present awareness of “having been“, which allows the past to exist in the present. The relationship to the future is the state of anticipating a potential possibility, task, or engagement. It is related to the human propensity for caring and being concerned, which causes “being ahead of oneself” when thinking of a pending occurrence. Therefore, this concern for a potential occurrence also allows the future to exist in the present. The present becomes an experience, which is qualitative instead of quantitative. Heidegger seems to think this is the way that a linear relationship with time, or temporal existence, is broken or transcended.We are not stuck in sequential time. We are able to remember the past and project into the future – we have a kind of random access to our representation of temporal existence — we can, in our thoughts, step out of (ecstasis) sequential time. In 5th century BC Greece, Antiphon the Sophist, in a fragment preserved from his chief work On Truth held that: “Time is not a reality (hypostasis), but a concept (noêma) or a measure (metron).”Parmenides went further, maintaining that time, motion, and change were illusions, leading to the paradoxes of his follower Zeno. Time as an illusion is also a common theme in Buddhistthought. J. M. E. McTaggart’s 1908 The Unreality of Time argues that, since every event has the characteristic of being both present and not present (i.e. future or past), that time is a self-contradictory idea (see also The flow of time). From the age of Newton to Einstein’s profound reinterpretation of the physical concepts associated with time and space, time was considered to be “absolute” and to flow “equably” (to use the words of Newton) for all observers. The science of classical mechanics is based on this Newtonian idea of time. Einstein, in his special theory of relativity,postulated the constancy and finiteness of the speed of light for all observers. He showed that this postulate, together with a reasonable definition for what it means for two events to be simultaneous, requires that distances appear compressed and time intervals appear lengthened for events associated with objects in motion relative to an inertial observer. Einstein showed that if time and space is measured using electromagnetic phenomena (like light bouncing between mirrors) then due to the constancy of the speed of light, time and space become mathematically entangled together in a certain way (called Minkowski space) which in turn results in Lorentz transformation and in entanglement of all other important derivative physical quantities (like energy, momentum, mass, force, etc.) in a certain 4-vectorial way (see special relativity for more details). In classical mechanics, Newton’s concept of “relative, apparent, and common time” can be used in the formulation of a prescription for the synchronization of clocks. Events seen by two different observers in motion relative to each other produce a mathematical concept of time that works pretty well for describing the everyday phenomena of most people’s experience. In the late nineteenth century, physicists encountered problems with the classical understanding of time, in connection with the behaviour of electricity and magnetism. Einstein resolved these problems by invoking a method of synchronizing clocks using the constant, finite speed of light as the maximum signal velocity. This led directly to the result that observers in motion relative to one another will measure different elapsed times for the same event. 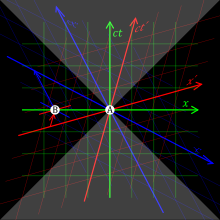 Two-dimensional space depicted in three-dimensional spacetime. 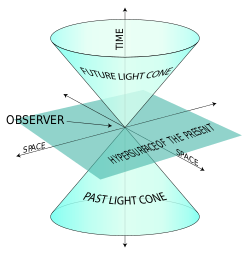 The past and future light cones are absolute, the “present” is a relative concept different for observers in relative motion. Time has historically been closely related with space, the two together comprising spacetime in Einstein’s special relativity and general relativity. According to these theories, the concept of time depends on the spatial reference frame of the observer, and the human perception as well as the measurement by instruments such as clocks are different for observers in relative motion. The past is the set of events that can send light signals to the observer; the future is the set of events to which the observer can send light signals. Relativity of simultaneity: Event B is simultaneous with A in the green reference frame, but it occurred before in the blue frame, and will occur later in the red frame. Einstein showed in his thought experiments that people travelling at different speeds, while agreeing on cause and effect, will measure different time separations between events and can even observe different chronological orderings between non-causally related events. Though these effects are typically minute in the human experience, the effect becomes much more pronounced for objects moving at speeds approaching the speed of light. Many subatomic particles exist for only a fixed fraction of a second in a lab relatively at rest, but some that travel close to the speed of light can be measured to travel further and survive much longer than expected (a muon is one example). According to the special theory of relativity, in the high-speed particle’s frame of reference, it exists, on the average, for a standard amount of time known as its mean lifetime, and the distance it travels in that time is zero, because its velocity is zero. Relative to a frame of reference at rest, time seems to “slow down” for the particle. Relative to the high-speed particle, distances seem to shorten. Even in Newtonian terms time may be considered the fourth dimension of motion; but Einstein showed how both temporal and spatial dimensions can be altered (or “warped”) by high-speed motion. Views of spacetime along the world lineof a rapidly accelerating observer in a relativistic universe. The events (“dots”) that pass the two diagonal lines in the bottom half of the image (the past light cone of the observer in the origin) are the events visible to the observer. The animations visualise the different treatments of time in the Newtonian and the relativistic descriptions. At the heart of these differences are the Galileanand Lorentz transformations applicable in the Newtonian and relativistic theories, respectively. In the figures, the vertical direction indicates time. The horizontal direction indicates distance (only one spatial dimension is taken into account), and the thick dashed curve is the spacetime trajectory (“world line”) of the observer. The small dots indicate specific (past and future) events in spacetime. In the Newtonian description these changes are such that time is absolute: the movements of the observer do not influence whether an event occurs in the ‘now’ (i.e. whether an event passes the horizontal line through the observer). However, in the relativistic description the observability of events is absolute: the movements of the observer do not influence whether an event passes the “light cone” of the observer. Notice that with the change from a Newtonian to a relativistic description, the concept of absolute time is no longer applicable: events move up-and-down in the figure depending on the acceleration of the observer. Time appears to have a direction – the past lies behind, fixed and immutable, while the future lies ahead and is not necessarily fixed. Yet for the most part the laws of physics do not specify an arrow of time, and allow any process to proceed both forward and in reverse. This is generally a consequence of time being modeled by a parameter in the system being analyzed, where there is no “proper time”: the direction of the arrow of time is arbitrary. The exceptions include theSecond law of thermodynamics, which states that entropy must increase over time (see Entropy); the cosmological arrow of time, which points away from theBig Bang, and the radiative arrow of time, caused by light only traveling forwards in time (see light cone). In particle physics, the violation of CP symmetry implies that there should be a small counterbalancing time asymmetry to preserve CPT symmetry. The standard description of measurement in quantum mechanics is also time asymmetric (see Measurement in quantum mechanics). At the macroscopic level, some events do not seem reversible; some events in movies seem preposterous when played backwards, such as dye mixed in water separating out over time, and people inhaling over birthday cakes to light the candles. Planck time (~ 5.4 × 10−44 seconds) is the unit of time in the system of natural units known as Planck units. Current established physical theories are believed to fail at this time scale, and many physicists expect that the Planck time might be the smallest unit of time that could ever be measured, even in principle. Tentative physical theories that describe this time scale exist; see for instanceloop quantum gravity. Stephen Hawking in particular has addressed a connection between time and the Big Bang. 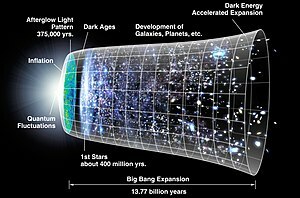 In A Brief History of Time and elsewhere, Hawking says that even if time did not begin with the Big Bang and there were another time frame before the Big Bang, no information from events then would be accessible to us, and nothing that happened then would have any effect upon the present time-frame. Upon occasion, Hawking has stated that time actually began with the Big Bang, and that questions about what happened before the Big Bang are meaningless. This less-nuanced, but commonly repeated formulation has received criticisms from philosophers such as Aristotelian philosopher Mortimer J. Adler. Scientists have come to some agreement on descriptions of events that happened 10−35 seconds after the Big Bang, but generally agree that descriptions about what happened before one Planck time(5 × 10−44 seconds) after the Big Bang are likely to remain pure speculation. A graphical representation of the expansion of the universe with the inflationary epoch represented as the dramatic expansion of the metric seen on the left. While the Big Bang model is well established in cosmology, it is likely to be refined in the future. Little is known about the earliest moments of the universe’s history. The Penrose-Hawking singularity theorems require the existence of a singularity at the beginning of cosmic time. However, these theorems assume that general relativity is correct, but general relativity must break down before the universe reaches thePlanck temperature, and a correct treatment of quantum gravity may avoid the singularity. There may also be parts of the universe well beyond what can be observed in principle. If inflation occurred this is likely, for exponential expansion would push large regions of space beyond our observable horizon. models including the Hartle–Hawking boundary condition in which the whole of space-time is finite; the Big Bang does represent the limit of time, but without the need for a singularity. brane cosmology models in which inflation is due to the movement of branes in string theory; the pre-big bang model; the ekpyroticmodel, in which the Big Bang is the result of a collision between branes; and the cyclic model, a variant of the ekpyrotic model in which collisions occur periodically. chaotic inflation, in which inflation events start here and there in a random quantum-gravity foam, each leading to a bubble universeexpanding from its own big bang. Proposals in the last two categories see the Big Bang as an event in a much larger and older universe, or multiverse, and not the literal beginning. Time travel is the concept of moving backwards and/or forwards to different points in time, in a manner analogous to moving through space, and different from the normal “flow” of time to an earthbound observer. In this view, all points in time (including future times) “persist” in some way. Time travel has been a plot device in fiction since the 19th century. Travelling backwards in time has never been verified, presents many theoretic problems, and may be an impossibility. Any technological device, whether fictional or hypothetical, that is used to achieve time travel is known as a time machine. A central problem with time travel to the past is the violation of causality; should an effect precede its cause, it would give rise to the possibility of temporal paradox. Some interpretations of time travel resolve this by accepting the possibility of travel between parallel realities or universes. Theory would point toward there having to be a physical dimension in which one could travel to, where the present (i.e. the point which one is leaving) would exist at a fixed point relative in either the past or future. Seeing as this theory would be dependent upon the theory of a multiverse, it is uncertain how or if it would be possible to just prove the possibility of time travel. Another solution to the problem of causality-based temporal paradoxes is that such paradoxes cannot arise simply because they have not arisen. As illustrated in numerous works of fiction, free willeither ceases to exist in the past or the outcomes of such decisions are predetermined. As such, it would not be possible to enact the grandfather paradox because it is a historical fact that your grandfather was not killed before his child (your parent) was conceived. This view simply holds that history is an unchangeable constant. More elaboration on this view can be found in the Novikov self-consistency principle. The specious present refers to the time duration wherein one’s perceptions are considered to be in the present. The experienced present is said to be ‘specious’ in that, unlike the objective present, it is an interval and not a durationless instant. The term specious present was first introduced by the psychologist E.R. Clay, and later developed by William James. The brain’s judgement of time is known to be a highly distributed system, including at least the cerebral cortex, cerebellum and basal ganglia as its components. One particular component, thesuprachiasmatic nuclei, is responsible for the circadian (or daily) rhythm, while other cell clusters appear to be capable of shorter-range (ultradian) timekeeping. Psychoactive drugs can impair the judgement of time. Stimulants can lead both humans and rats to overestimate time intervals, while depressants can have the opposite effect. The level of activity in the brain of neurotransmitters such as dopamine and norepinephrine may be the reason for this. In addition to psychoactive drugs, judgements of time can be altered by temporal illusions (like the kappa effect ), age, and hypnosis. The sense of time is impaired in some people with neurological diseases such as Parkinson’s disease and attention deficit disorder. Psychologists assert that time seems to go faster with age, but the literature on this age-related perception of time remains controversial. As an example, one day to an eleven-year-old person would be approximately 1/4,000 of their life, while one day to a 55-year-old would be approximately 1/20,000 of their life. According to such an interpretation, a day would appear much longer to a young child than to an adult, even though the measure of time is the same. In sociology and anthropology, time discipline is the general name given to social and economic rules, conventions, customs, and expectations governing the measurement of time, the social currency and awareness of time measurements, and people’s expectations concerning the observance of these customs by others. Arlie Russell Hochschild and Norbert Elias have written on the use of time from a sociological perspective. The use of time is an important issue in understanding human behaviour, education, and travel behaviour. Time use research is a developing field of study. The question concerns how time is allocated across a number of activities (such as time spent at home, at work, shopping, etc.). Time use changes with technology, as the television or the Internet created new opportunities to use time in different ways. However, some aspects of time use are relatively stable over long periods of time, such as the amount of time spent traveling to work, which despite major changes in transport, has been observed to be about 20–30 minutes one-way for a large number of cities over a long period of time. Time management is the organization of tasks or events by first estimating how much time a task will take to be completed, when it must be completed, and then adjusting events that would interfere with its completion so that completion is reached in the appropriate amount of time. Calendars and day planners are common examples of time management tools. A sequence of events, or series of events, is a sequence of items, facts, events, actions, changes, or procedural steps, arranged in time order (chronological order), often with cause and effectrelationships among the items. Because of causality, cause precedes effect, or cause and effect may appear together in a single item, but effect never precedes cause. A sequence of events can be presented in text, tables, charts, or timelines. The description of the items or events may include a timestamp. A sequence of events that includes the time along with place or location information to describe a sequential path may be referred to as a world line. Uses of a sequence of events include stories, historical events (chronology), directions and steps in procedures, and timetables for scheduling activities. A sequence of events may also be used to help describe processes in science, technology, and medicine. A sequence of events may be focused on past events (e.g., stories, history, chronology), on future events that need to be in a predetermined order (e.g., plans, schedules, procedures, timetables), or focused on the observation of past events with the expectation that the events will occur in the future (e.g., processes). The use of a sequence of events occurs in fields as diverse as machines (cam timer), documentaries (Seconds From Disaster), law (choice of law), computer simulation (discrete event simulation), and electric power transmission (sequence of events recorder). A specific example of a sequence of events is the timeline of the Fukushima Daiichi nuclear disaster.